There are many ways you can edit a PDF file, using a online or offline pdf editor and that’s without using Adobe’s Acrobat software. In this article we will see various methods by which we can easily edit a PDF document with the help some really good free PDF editor. PDF Editor is not only confined to changes in text, but we can also change the format, layout of elements inside the file. For example – if an image is aligned at the top left corner and we want to change its location then with simple drag and drop feature we can move the image from top left to top center. All the editors below have some basic run down steps, when it comes to usage. Mostly have a common way to upload the file and edit in a drag and drop or double-clicking on text. Its one of the most popular free PDF editor as enables us to edit a PDF file by simply uploading and drag drop features which are very easy in comparison to other tools. One more advanced feature of PDFEscape is that it also give you option to edit a password protected PDF file. With an option of editing metadata this windows software is really a gem, it helps PDF files to be searched on google search with metadata, which is really essential if you have uploaded it for public use. Besides free PDF Editor tools, you can learn more about editing PDFs by checking out JotForm’s guide. It dives into common issues with editing PDFs, how to automate PDF creation using forms, and much more. Another really useful tool which enables you to convert a PDF file into a word document. PDFToword also does the same. 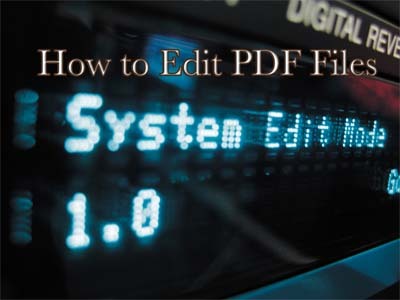 By doing this you will be able to edit the file in word and then converting them back into a PDF file. If not the best, it certainly has great capability to have a significant rank in free PDF editor. This is a best reader and editor which are free, fast and it lets you edit the text of any PDF. Its one of my favorite tool. Hosted by sourceforge, this software is easy to us and it enables you to edit the raw PDF objects with many GUI functions. A simple enough online service where you can convert the PDF to text, just upload and enter your email, where you will get the converted document in minutes. For OCR image based PDF files which you are looking to edit can be done with the help of this software. Although its a an free vector drawing tool but it also has capabilities to export and import PDF files. It has a extension for PDF import which let users to change the format and adds support to shapes, images, annotations etc. Let us know, if you have more tools or programs which can edit a PDF file easily and can be included in this list of free pdf editor. We will be adding it to our list.